A gentle, thought-provoking, and artistic experiment from the mind of indie developer Daniel Benmurgui and distributed by Atakama Labs, Today I Die Again is the retooled iPhone port of the avant-garde and freely available webgame, Today I Die. Far from being a best-selling crowd pleaser, Today I Die Again is less a game and more a piece of technological poetry dedicated to the sensitive dreamers out there. Benmurgui, also the maker of I Wish I Were the Moon, is known for his very unusual and artistic creations. Today I Die Again is a shining example of his unique style, combining very rough pixelated graphics with exceptionally enigmatic storytelling and gameplay, and the results are simultaneously beautiful, cerebral, and haunting. Much of the game’s appeal is rooted in a sense of exploration and discovery, so I won’t go into much detail here, but suffice to say, this is not your typical gaming app. There is no tutorial, no help screen, no instructions of any kind, and the purposefully clunky graphics serve as a kind of artistic shorthand, forcing your brain to wake up and really think about what it is doing. 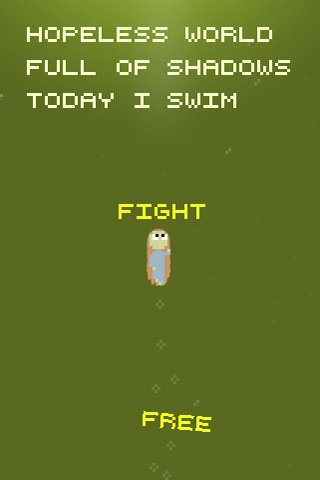 As a game, Today I Die Again won’t really satisfy, as it is very short and can be “beaten” in about five minutes. As a piece of experimental art, it is much more successful, although it is likely to be denounced as boring and pretentious by many. Personally, I was quite delighted with how skillfully gameplay and narrative were interwoven in such a short piece, and I would be sincerely pleased to see more artistic projects like these made widely available on the App Store. Today I Die Again can’t and won’t be appreciated by everyone, but it will be a breath of fresh air to those who can recognize its unique qualities. In a scant five minutes, it manages to be inspiring, charming, and memorable, and even more than that, it helps restore my faith that creativity in gaming is not limited to the stagnant pool of sequels, uninspired trash, and clones of more popular games. 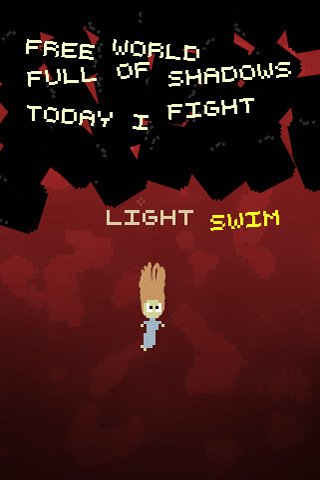 AppSafari review of Today I Die Again was written by Tracy Yonemoto on January 27th, 2011 and categorized under Adventure, App Store, Art, Featured, Games, Puzzler. Page viewed 4365 times, 1 so far today. Need help on using these apps? Please read the Help Page.